Eyestrain can be the result of any activity in which the eyes focus in one place for a long time. Using a computer screen for much of the day is one of the worst culprits. Reading for long periods, particularly in bad light can also lead to eyestrain. Needlework, cross stitch and craft work also require concentration on detail and focus on small objects close to your hands. All can cause the eyes to stay focused on things within an arms’ length and can make it difficult to then focus on objects further away. You may have difficulty seeing things in the distance when you have been doing close work – even if you have no eye pain or headache, this is still a very clear indication that you are developing eyestrain. Eye strain headaches tend to be unilateral – the pain affects mainly one side of the head. This is usually associated with the eye that has been particularly strained and some people will find they have an eyestrain headache always behind the same eye. This may suggest that the eye affected is weaker, and perhaps needs a different prescription for contact lenses or glasses. Others will find that eyestrain headaches affect both eyes, but perhaps not at the same time, so the headache is sometimes on the left and sometimes on the right. 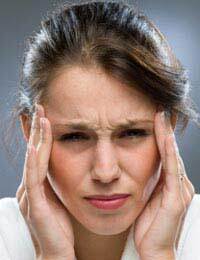 Eye strain headaches can be severe but generally are much less painful that migraines or cluster headaches. The ache is a dull, long-lasting one rather than a sharp, intense pain. It can get worse if you continue to try to do close work or computer work; this is the body’s mechanism of preventing further strain on the eye muscles. Most of us have to concentrate on close work for large parts of our time. Studying, hobbies and computer work all cause eyestrain but there are things that you can do during the day to help prevent the worst effects. Taking a break every half an hour to focus on objects in the distance is a good idea – just looking around the room and out of the window, so your eyes can adjust their focus can really help. Most people cannot help doing this after a while, it seems to be a natural distraction but see it as a healthy action, rather than feeling guilty about breaking off from work for a few minutes. Every two hours or so, or at least twice a day, it is a good idea to sit with the palms of your hands cupped gently over your eyes to give them a complete rest. Close your eyes and site comfortably at a desk with your elbows resting on the surface. Do some breathing exercises and try to clear your mind as you do the palming. After just two to three minutes, you will feel calmer and your eyes will feel refreshed. You can also try bathing your eyes alternately with warm and cold water, just closing your eyes for a few minutes, going out for a walk and focusing on the horizon for half an hour at lunchtime, and remember to drink plenty of water. Dry eyes are a common problem with computer work and drinking more can help counteract that. If eyestrain headaches happen regularly, and continue even if you do some of the preventive actions described, it is a good idea to get an optician’s appointment to check out your eye health. It may be that your eyes are struggling to focus because of short sightedness, long sightedness (such as age-related changes to the lenses) or astigmatism. Eye conditions such as glaucoma can also cause eyestrain and headaches and these will be picked up during a routine eye test. If you do succumb to eyestrain, the best thing to do is to rest your eyes for 24 hours, with no close work and no computer screens. Even television might not be advisable. Many people find that eyestrain headaches do not respond very well to painkillers, so taking paracetamol or ibuprofen may not help very much. Sleep, resting and perhaps some time spent outside may help but many cases of eyestrain need 24 hours for the strained eye muscles to recover and there is little that you can do to rush this process.